AEMT Sandi Smith and Dispatcher/EMT Seth Wells. POMEROY – Meigs County EMS Director Robert Jacks announced that AEMT Sandi Smith has been selected as the 2018 Field Employee of the Year. AEMT Smith was previously recognized for the award in 2013. Dispatcher Seth Wells was selected as the 911 Communications Employee of the Year. The selection of AEMT Smith and Dispatcher Wells is in recognition of outstanding service during 2018 to the citizens of Meigs County. 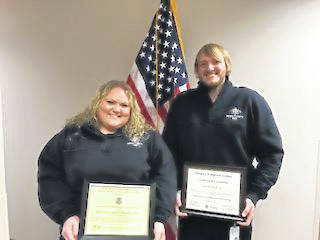 Fellow employees from Meigs County EMS chose both recipients based on leadership abilities, professional ethics, courteous treatment of others, enthusiastic work attitude, and cooperation with supervisors, peers, and the public. Director Jacks described both employees as dedicated public servants that go above and beyond to serve the citizens of Meigs County. AEMT Smith leads several initiatives for the agency, including the annual Christmas project to help people in need and the newly formed Ohio River Critical Incident Stress Management Team. Dispatcher Wells also works in the field as an EMT in addition to his full-time role as a dispatcher in the communications center. AEMT Smith joined Meigs County EMS in 2005 and has served at Station 11 and Station 2. Sandi is a graduate of Southern High School and resides in Racine. She is the daughter of Larry and Lisa Smith. Dispatcher Wells joined MCEMS/911 in 2016. Seth resides in Rutland and is a graduate of Meigs High School. Seth is the son of Heather Cantwell and Jamie Friery. Information provided by Meigs County EMS.